John W. Bardwell constructed a cotton gin one mile SW of the present location in the 1880s and modestly named the town after himself. The community used the nearby Bethany school for a church and and buried their dead in the Bethany cemetery. Bardwell built their own school in 1892 and Baptist and Methodist churches in 1893. A post office branch was opened that same year. In 1907 the Trinity and Brazos Valley Railway came through Ellis County and the community moved to be near it. 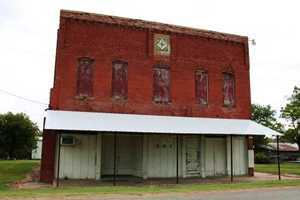 Bardwell prospered throughout the 1920s as a cotton shipping point with three gins in operation and six grocery stores. 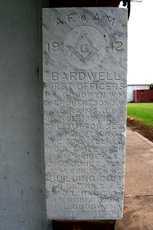 By 1914 Bardwell had electricity and telephone service from Ennis. In 1929 the population was 650 - while declined drastically during the Great Depression. With the building of the Highway 34 in the early 1940s, the businesses moved again. Bardwell's school consolidated with the Ennis ISD in the late 1950s. In 1972 Bardwell had 277 which has since increased to the present 668. The 1912 Masonic Lodge cornerstone.